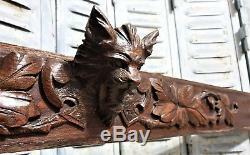 Architectural griffin scroll leaves Antique french carved wood crest panel trim. It's a salvaged piece - one small wood lack behind the head (heart) - tiny fixing holes - dirt - wear - usual wear. Length : 44.09 in (112 cm) - Max Height : 5.71 in (14,5 cm). 1.81 lb - (820 gr). The item "Architectural griffin scroll leaves Antique french carved wood crest panel trim" is in sale since Thursday, September 27, 2018. This item is in the category "Antiques\Architectural & Garden\Pediments". The seller is "lescimaisesdorees" and is located in Sorgues.